A birthday party is being held for Carrie Ingalls and you are all invited! Guests are encouraged to dress in the period of the 1890s (when Keystone was first established as a town). A contest will be held, with prizes of $25 given for the best children's costume and the best adult costume. There will be children's activities, as well as a watermelon contest. And of course, no birthday party is complete without the cake! Cake with punch or coffee will be served to all guests. If you live in or will be visiting the Black Hills area this weekend, don't miss the opportunity to take part in Carrie's birthday party! Carrie was born August 3, 1870, in Kansas. She spent the later years of her life in Keystone, with her husband David Swanzey and stepchildren Mary and Harold. 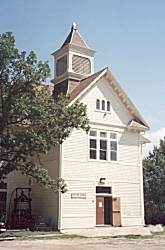 The Keystone Area Historical Society has their museum in the old Keystone Schoolhouse. "Little House" fans will enjoy the Carrie Ingalls display there, which includes many of Carrie's personal possessions, the gravestone of Ma's brother, Henry Quiner, who also lived in the area, and a china figure owned by Carrie which some say may be Ma's china shepherdess. More information about Carrie's life can be found at Laura Ingalls Wilder, Frontier Girl. Please visit the website for the Keystone Area Historical Society for more information about what they have to offer.